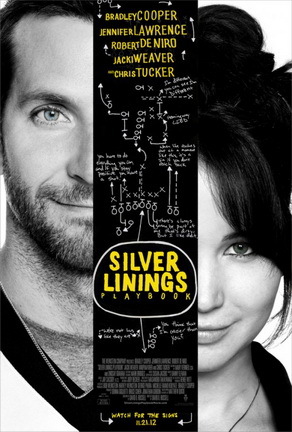 Speakin' Geek: Silver Linings Playbook; Are Cooper and Lawrence onto a winner? Silver Linings Playbook; Are Cooper and Lawrence onto a winner? Cooper and Lawrence...sounds like a law firm. Right so i'm just out of the cinema, and I'll explain to you how I gauge a film. It's a simple procedure but in my opinion it gets the job done.I see if I can remember the names of the characters and NOT the name of the actors. For example isn't 'Ron Perlman' hilarious in 'Pathfinder' along with 'Jim Caviezel'. I remember watching that film and shouting at the top of my lungs, Ron Perlman!? every time he would appear on-screen. It made for a lot of fun with the lads, especially because there was alcohol already involved. Now you understand that when I say the character Pat has shown me an incredible moment in his life where he meets the eccentric Tiffany and goes on a very real and powerful journey. Before this film I was pretty much on the fence with Bradley Cooper and Jennifer Lawrence. They both had film franchises on their C.Vs, Cooper with 'The Hangover' and Lawrence has not only the 'X-Men' franchise but also 'The Hunger Games'. Now everyone loves these films, maybe 'The Hunger Games' more so since it's very much in the style of 'Twilight'. Now when I saw Jennifer Lawrence in 'X-Men First Class' as Mystique I thought yeah she's decent but she's no Rebecca Romain Stamos. She brought an interesting side to Mystique a character we have seen with multiple angles and iterations. In the end she was passable, not the biggest draw of the film but not the worst, January Jones anyone?. Now in 'The Hunger Games' Lawrence takes leaps and bounds in her portrayal as 'Katniss Everdeen' a distraught and troubled woman in a dystopian future. She was much more believable and honest, and I really enjoyed her in it, the film was okay, she was great. With Bradley it was a harder sell for me because I can't think of a film, apart from 'The Hangover', where he I was even slightly interested in his character. In my opinion he is the least comedic of the ensemble in both Hangover films and I will argue that until my dying day. Now when I saw the trailer to this film I was genuinely interested in the idea, the subject matter of mental problems has been dealt before, time and time again. This time however it felt more genuine, more honest and when I saw the chemistry between Cooper and Lawrence I was sold. When I mean sold, I mean that I would use my Cineworld unlimited card, which allows me to see as many films as I want a month for 20 euro, to see it. From the opening scene you know almost immediately that this is a different Bradley Cooper than you've seen in previous films. He's vulnerable, he's broken and yet there is a roughness to him, a frankness which comes off as unusually charming. I won't spoil the plot for you all but it's fantastic, a while back I found out that Bradley Cooper was in the running for the part of Hal Jordan in the now royally ripped apart 'Green Lantern' film. I believe that he would have been a much more welcome man behind the green mask. With wonderful chemistry between the two leads, a fantastic supporting cast lead by the wonderful Robert De Niro( Who is back doing what he does best, great acting, not another 'Meet the Parents' sequel) and a soundtrack by Danny Elfman you do not want to miss this. P.S Chris Tucker is in this and does the best acting of his career I kid you not. The Hobbit; An Unexpected Interview.